Looking to redecorate a room? How about adding a customizable wall decal? Open to US and Canada residents, you have through 2/10 to enter. Good luck. It is a new year, so why not make some plans to redecorate a room in your house? EvgieNev Wall Decals are beautiful and affordable. The vinyl decals they use feels like it is smoothly painted on the wall after the application; but easily removable should you choose to redesign. They have several designs but the most popular choices are for your kids rooms. You can set the scene of an explorer, astronaut, and more with their awesome designs. They are customizable wall decals and they are easy to apply. You don't need to paint a room to add more personality to them - you can create beautiful scenes with wall decals! 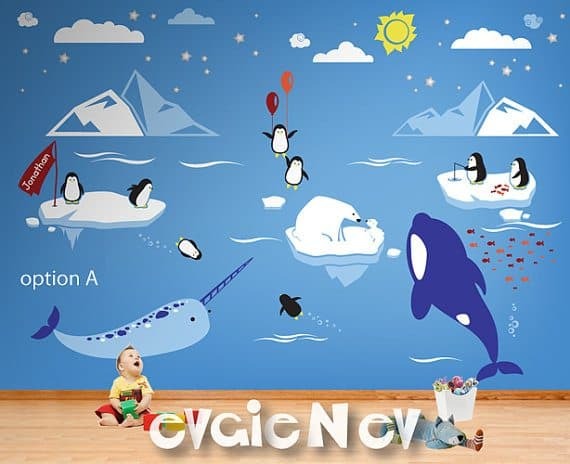 Polar Friends is new amazing addition to our collection of wall decals for nursery showing Penguins having fun and Polar Mama Bear with Cub and two famous Whales, on the background of ocean with icebergs and mountains. Marvellous First Nations wall decals theme featuring Pioneer Time playing camp with TeePee, Canoe, friendly Black Bear, Campfire and Eagle, set on natural landscape and surrounded by magnificent Mountains, Clouds and Stars, this is a very warm illustrative setup promoting empathy and imagination of play time while highlighting Indigenous People history and spirit! Mind-blowing Outer Space wall decals theme featuring Custom Flag Name with space-walking Anstronauts, spaceship, aliens, asteroids and dots to create constellations. Imagine roaring safari lions with monkeys playing tricks all around and large rainforest trees. 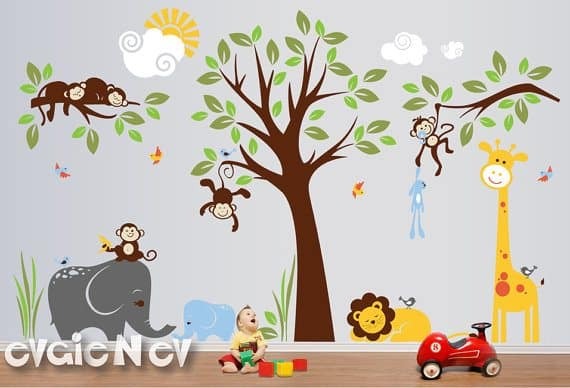 Evgie nursery wall decals from Jungle Safari collection has been crafted especially to brighten the playroom and animate jungle themed nursery with African animals and recognized characters such as Lion King or Tarzan. 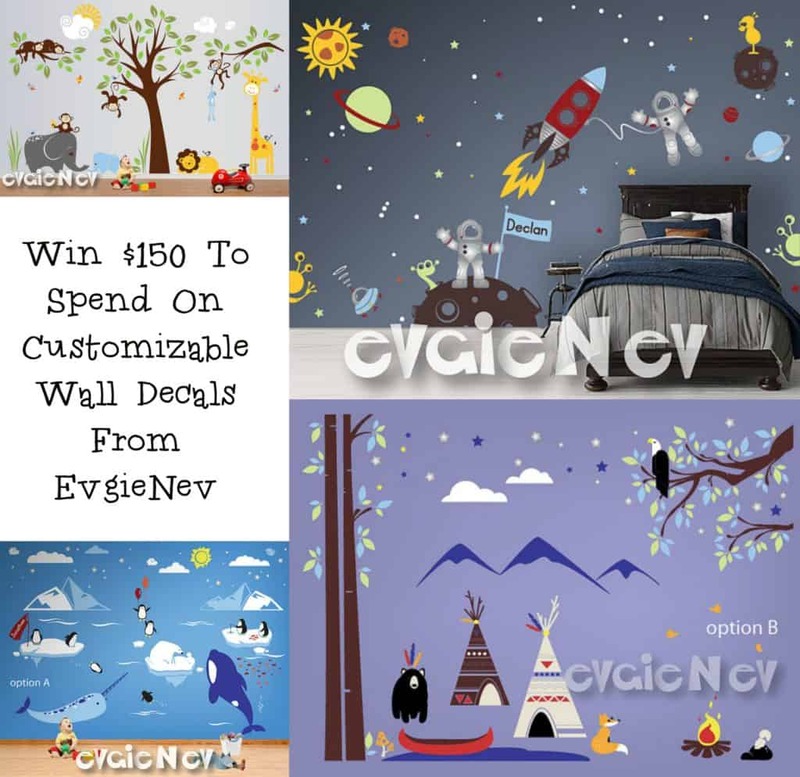 Enter to win $150 to spend on wall decals from EvgieNev! Open Worldwide (If outside the US or Canada the winner will have to pay the difference in shipping.) Giveaway ends on February 10, 2017 at 11:59pm EST. I'd get the Arctic and Antarctic Animals Friends. I'd get the children's teepee wall decal. I would get Adorable Teddy Bears - Wall Decals and Baby Nursery Wall Stickers - PLTBRS030 - Winnie-the-Pooh. I would get the Teddy Bears LOVE Wall Decals. I would buy the Large Family Tree decal in black with lilac and grey leaves. I would get the Birds Tree Nursery Wall Decal - Large Side Tree with Birds and Nest- Perfect Tree Design for Picture Frames - TRFRM020. That would look awesome in our foyer! I like Forest Animals Wall Art - Fox, Deer, Bear, Racoon, Owls and Large Tree Wall Decals - PLFR050. I like the Ocean Friends Wall Decals. I like the Cream Fabric Flower Guitar Strap. I love this one, Children Wall Decal Tree Wall Decal Animal. This would look very nice in the children room. Family Tree Wall Decal -Picture Frame Background Wall Decals - Large Tree Wall Sticker - TRFMLY010 is a favorite. I love the panda bears nursery decals!